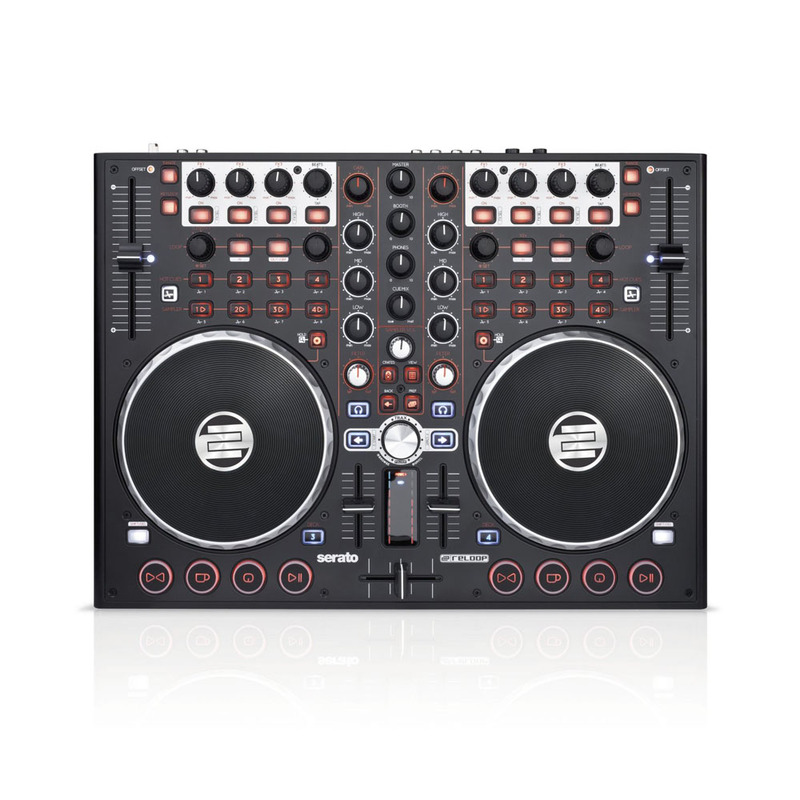 Reloop Terminal Mix 2 Controller Bundled with Serato DJ and Serato Video, Black DJParts - All Variety of Parts that DJ Needs. This Reloop hardware bundle consists of the award-winning Reloop Terminal Mix 2 Controller, the exciting new Serato DJ software, and the powerful video plug-in Video SL, which is offered as a free download. In addition to the popular Trax Encoder, the master section is now equipped with four convenient management buttons which allow direct access to playlists, crates or further layout views without the need to touch your laptop. This means a desired track can be located and loaded instantly into any deck via the designated load buttons. Reloop has also developed brand new ultra-flat aluminum jog platters which with an impressive XXL diameter of 15.5 cm have also been enhanced with a non-slip vinyl-grip coating for even more control over your tracks. With a total of 3 modes (Pitch Bend/Vinyl/Quick Search) it"s possible to easily switch between pitch correcting, scratching, or browsing through tracks on the fly. The entire transport section is fully equipped with rubberized buttons which offer a comfortable pressure point while also being extremely durable. The FX section is equipped with 4 buttons, 3 rotary knobs, and 1 endless encoder to provide even more creative possibilities in the mix. The smart loop section also features 4 independent controls allowing users to quickly set beat-precise loops, adjust the size of the loops and even move the loops while in a live situation. Reloop has listened to the requests of many DJs and for the first time has integrated a 14 bit pitch fader with 100mm increments, allowing ultra-precise mixing and blending. The audio section offers a vast array of connecting possibilities for your master PA (including balanced output jacks), a zone function and a DJ booth system. Also very practical are the 2 headphones connections (6.3 mm & 3.5 mm) which can be adjusted with a 1-band equalizer. Furthermore, it"s possible to connect a turntable, CD/MP3 player, or iPhone/iPod to the Aux input which can be routed to the master or even software.